I think all of us are collectors. Some collect jokes, recipes, money, and junk. That's me. I collect junk and then I feel responsible to give that piece of junk meaning in life. So that is what I did with my Altoid box. But actually the idea started from a dream that someday I would be sitting on the banks of the Seine painting away while people threw coins into my recycled tin can. 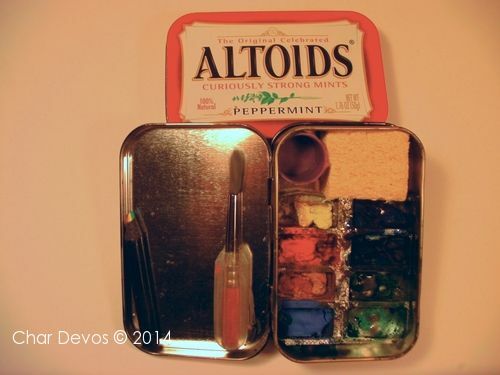 Knowing how portable my travel gear would have to be, I decided to contain all my painting supplies in an Altoid box. So I chewed a lot of Eclipse gum, saved the empty plastic, saved glue stick covers, trimmed an eye dropper, resized a brush, and cut up a sponge. Squirt, squirt, squirt some watercolor into the little gum compartments and whalla! . My "Art-toid" was born. Anybody want to go to Paris with me?